I get you with the price of that Chloe dress, I would love one too but the budget. The one you have on is perfect and close enough to it. Love your customised gladiators and the back pack makes the look girly. Thank you so much Jaime. Your comment is very kind. As for the S.W., I wish. I know which ones you’re referring to as I tried them on at Saks 5th Ave. Those are very literal to a ladder (straight up and down) and they’re gorgeous. I also loved a pair of Sigerson Morrison’s I tried on. They had a heavy amount of gold studs, almost too much. Thanks for stopping by. Love your dress! What a great DIY! Really creative!! Thank you very much Tatiana. Perfect summer look, the colour is simply gorgeous! Wow I love how you costumized your sandals! Amazing! Thank you so much Nadja. A little bit of embellishment can actually enhance a shoe. i absolutely adore the color of that dress! Really awesome way to get a runway style without spending so many zeros. You look amazing! Thanks Natalia. Yes, who knew I could there would be such a drastic savings. Just think, I was willing to spend up to $350 should I have found similar look. Love the gladiator sandals! They complement the outfit nicely by adding a little fierceness. Thanks Trou. I really try to play up the Roman/Gladiator look with backdrop & sandals. Thank you so much Brianna. You’re much too kind. So pretty! I love the little DIY touch you did with your gladiators! Lovely dress, I love its color and flowy moment. Thank you Nina. As for the sandals, they needed a something extra. Thanks Sophie, I try to have a fun element and/or inject it in somewhere. Gorgeous color on you, lady! Yea, for a short dress I really couldn’t work it out in my head to see the value. The most I’ve ever paid for you of her pieces was $1920. and that was for a dress that I loooooved. I’ve had it for two years and will have it for a few more. But this Forever21 version, OMG! I couldn’t pass it up. I purchased it in white as well. It is a beautiful dress but wow, I cannot imagine paying that for it. I bet you can find something similar that is a little more budget friendly. Love your look! Wait, Amy…. the one I’m wearing is a copy. I provided a link to the one I purchased from Forever21. Really cool what you did to the sandals! LOVE! Thanks Anna. I love a DIY moment. Great post! love the dress! I absolutely love this look! It erlly shows that we can get a high end look at any price point. Great find girl! Love the customized gladiator sandals. Great idea! Thank you Jeanie. Agreed. It may take a little time but most likely you will find a piece relatively similar. This one is almost spot on. I try to find dupes all the time, and this dress is perfect! There is no way I am ever paying that much for a dress! I love it and the color is gorgeous on you! It looks great with those customized gladiators! Those sandals are everything! You did an amazing job, and I love that blue color on you. Thank you very much Lauren. Just think, with all those studs I put on, I only burned one finger. such fun gladiator heels! love the details you added to them! great outfit! Hi stranger. Thanks Kelsey. I haven’t visited you blog in ages. I’ll have to stroll over now. 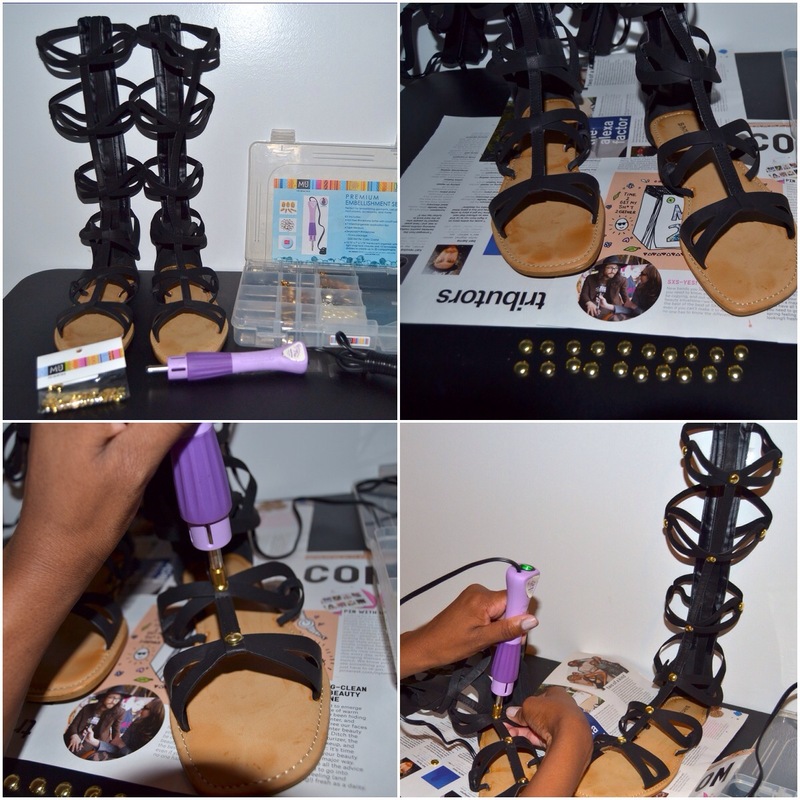 What a great way to customize those gladiator sandals! I’m a big fan of DIY, but I’m just so lazy. LOVE the LV backpack too! You know, I really love Chloe, but the price point is just too out of my budget. I love the Forever 21 dress that you chose though and you styled the outfit perfectly. Thanks Maggie. Not only myself but most others agree, that price point is way to high. However, if you’re a blogger she loans or grants the pieces to, not a problem. Happy you like my little DIY moment. I love how you DIY’d the shoes! I’m always too lazy to do stuff with my own clothing, but with the gold accents, it definitely makes the shoes more luxurious. Loving that LV bag too! Looks great with your outfit! Perfect choice of colors. Thank you so much Maggie. Love how you go in to detail with your comments. A girl after my own heart. I’m obsessed with that entire Chloe collection! Love your look for less! Those gladiator sandals are amazing! Chloe is the best, but I just can’t buy all her pieces. Only a piece I adore and I know I’ll get use of. I have a few of her dresses but that’s it. Mind you they’re all under $1500. Love the DIY! and that dress… love how you paired it with a belt! Thanks Sabrina. Unlike with the model, I have a full chest. I had to put on a bandeau (to hold the girls down) & then belt the dress to create a waistline or it would have looked like a maternity dress on me and no one wants that. 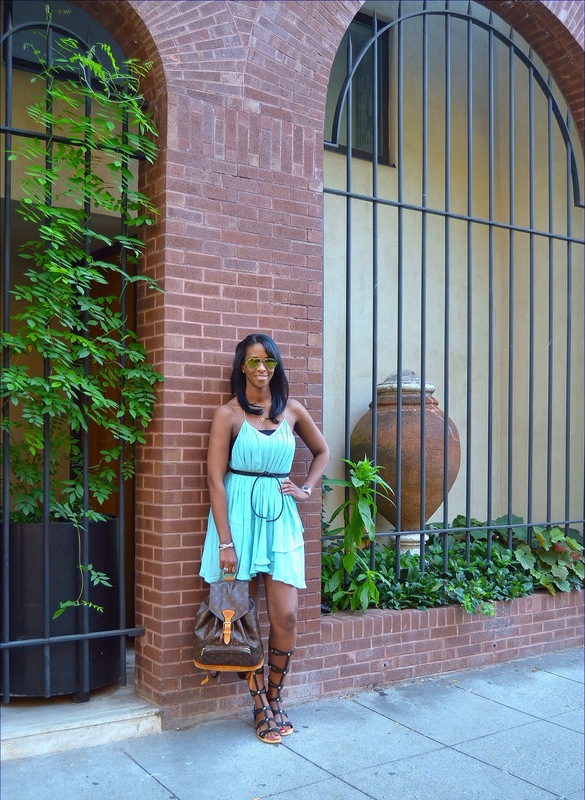 I’m loving this mint color on you and those gladiators are amazing! Indeed a great budget alternative! The dress looks great on you! I love the challenge of finding a copy and recreating looks for less. Hope you find the dress you’re looking for at a more affordable price. Lol lol lol. Oh ok, you noticed. That’s too funny, I thought you were under the impression I was wearing the Chloe frock. Hi Karen. Mission accomplished! I found the more affordable dress, I’m wearing it in the photos. The dress I’m wearing……does it really look like the Chloe? Similar but not identical in my opinion. Obsessed with those gladiator sandals! They look soo cute. Thanks Natalia. With a little bit of extra love & some patience, I was able to make them a bit more visually pleasing. Thank you so much Monica. You’re so sweet. 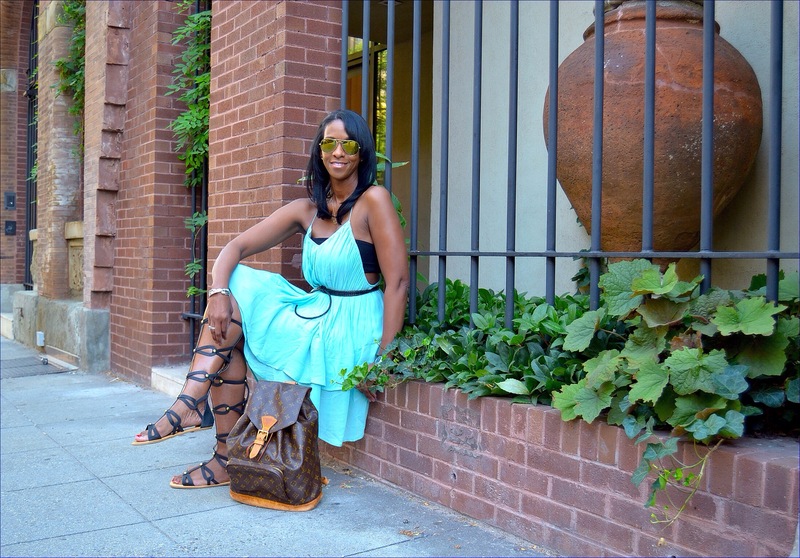 Awesome sandals… and I love that dress, such a lovely shade of blue! Thank you very much Amber. What a great dupe, it pretty much looks identical! And you can’t beat the price! Love the DIY sandals as well! Thanks Shannon. For this price, the copy is good enough. Oh my goodness, you’re so sweet Nicoleta. Hello dear, beautiful dress and I love the styling!! those customized sandals are so cute!!! Another super stylish look!!! I love it. Wow, thank you for making me feel great about my styling choices. Kelly! You’re much too flattering.mThank you so much. Love those dress! Gorgeous look! Thank you very much Daphne. Lol, kind of like my personality. Thanks Quinn. 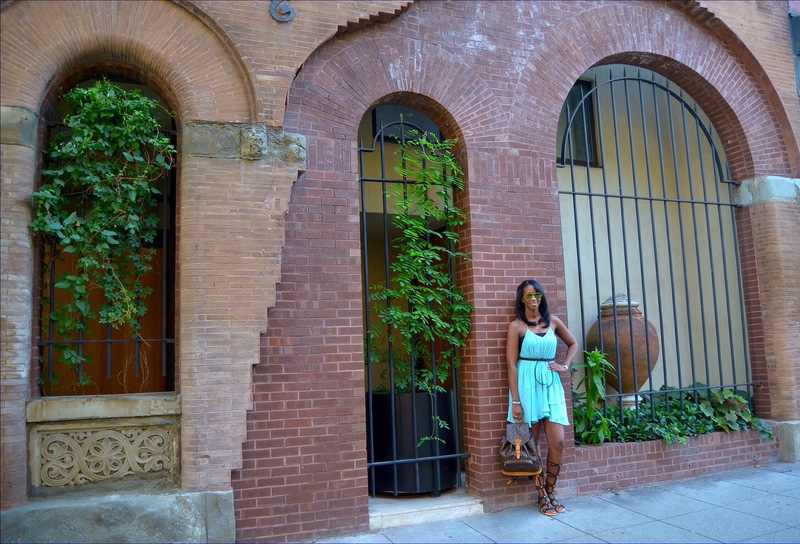 Wowww!, The color of that dress and the gladiator sandals apaired together is heaven! Thanks, I fell in love with the color as well. This is such a chic summery look! The color of the dress is amazing!